CNN Football Club: Dietmar Hamann answers your questions! 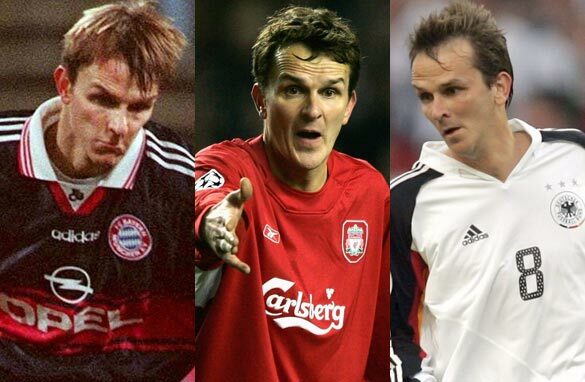 Former Liverpool and Germany star Dietmar Hamann answers your questions for CNN FC (Getty Images). His introduction at halftime in the 2005 Champions League final against AC Milan sparked one of the greatest comebacks sport has ever seen. Now former Liverpool and Germany stalwart Dietmar Hamann has answered your questions after appearing on CNN Football Club. A holding midfielder who played for Bayern Munich and Newcastle United before spending seven trophy-laden years at Anfield, Hamann knows what it takes to win European club football’s biggest prize. Hamann, who collected 59 caps for Germany between 1997 and 2005, was live in the studio to assess the week’s Champions League last-16 ties, including the second leg of the colossal clash between Real Madrid and Manchester United. He reveals what was it like to take a penalty in a Champions League final, and how Liverpool recovered from 3-0 down to become European champions? You can also get involved in the European football debate by voting in our poll, which this week asks the question: Was Nani's red card the reason Man Utd lost? Root or Compton to open the batting for England? Your thoughts on Joey Barton as a player, as a colleague and as a man? Dimetri, wat was going tru ur mind wen u wer about to take d 1st penalty for liverpool after seeing Sergio miss d 1 st for AC? Can the current German national team overcome the the tag as the second best team after Spain? What happened at half time when you were 3-0 down? Myself, far from being a lIverpool fan, couldn't understand why you didn't start. Did the players say something or what it only the manager's decision? What would have you been if not a footballer? How many players are Liverpool short of in challenging for the title? Is Brendan Rodgers the right man to lead the team forward? Is Diego Lopez gonna replace Casillas as Madrid's number 1 after an impressible show against Barca and Manutd??? in my own sadi i think tha the red cared was not normal and that is way manchester united couldn't make it.